What to consider when buying an dirt scooter. Dirt scooters are an awesome addition to a scooter collection. They are different to kick or stunt scooters in that they are designed to be ridden off road on all kinds of different terrain. They can cover all kinds mud tracks, drops, grass and other terrain which would be inaccessble on a traditional scooter. This access to new terrain adds another fun factor to the scooting experience. Dirt scooters need to cope with the uneven terrain such as mud. Therefore they do tend to be heavier, stronger, with bigger wheels and tyres to absorb the off road shocks. Older kids, teens and adults may also be keen to use dirt scooters on bmx trails and dirt tracks where they can try out jumps and high impact manoeuvres. They are amazing for adventurous kids who want to try out something fun, exciting and a bit different away from the skate park. It's important to choose the right scooter which is strong but lightweight to cope with the extra force required in landings. 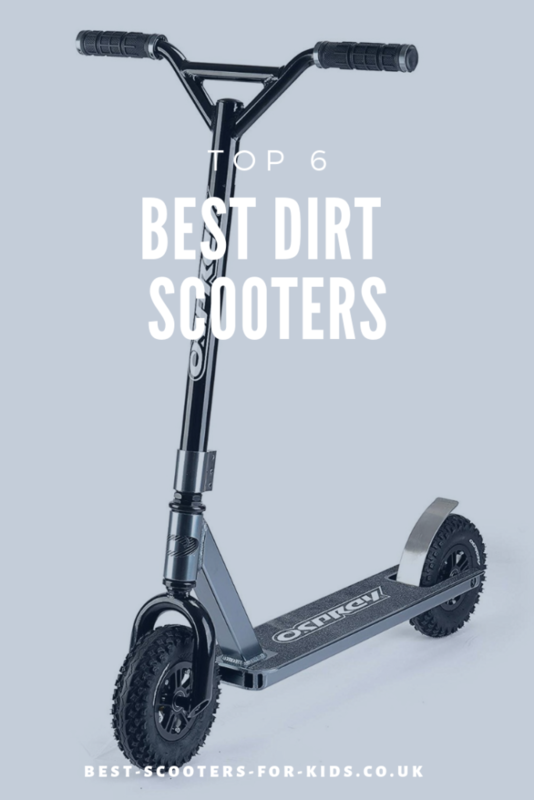 Skip the buying guide and go straight to the top dirt scooter picks. Like all scooters, there is much to consider when buying a dirt scooter. Some questions will be can the rider cope with the extra weight of a dirt scooter? If you are buying for a child, than the age, height and weight of the child you are buying for will be need to be taken into consideration. It is important the scooter is strong enough to withstand off road riding, however if it is too heavy, it may be difficult for younger and smaller kids to control. In this case you will need to look for a dirt scooter which is specifically made for the younger rider. They will be lighter and easier for them to use. Some dirt scooters will have a recommended age range. Some dirt scooters can be very heavy. This is fine if you are an older, stronger rider. However, ulitmately you want the lightest dirt scooter that your budget can accommodate as lighter dirt scooters tend to be easier to control and nicer to ride. More expensive scooters tend to be made with stronger materials but are designed in such a way that they are more lightweight. The main difference between traditional scooters and all terrain scooters are the wheels. The wheels are bigger and will feature high pressure, all terrain tyres so they can cope with the rougher ground. Like car tyres, they will have different treads and patterns. The type of tread may offer increased traction when riding so is something to consider. Look for a nobbly tyres which will offer increased traction. The wheel size may be a factor you want to consider when choosing your scooter. Larger wheels offer smoother ride on some of the toughest terrains which is why generally dirt scooters all have a large sized wheels. If you want a little more control perhaps to do a few off road jumps and stunts (perhaps on a bmx trail), you may want to consider slightly smaller wheels. Split core hubs on dirt scooter wheels are something to look out for as it makes it easy to change the tyres. However, they do tend to be on more expensive models and are not a necessity. Like all scooters there will be a maximum weight that the scooter can accommodate. This is important to note as you want to make sure a dirt scooter will last for a growing child. You also want to make sure that it will accommodate a teen or adult if that is what you want from the scooter. If possible get the lightest scooter that will accommodate your weight. If you or your child is not very heavy, a scooter with a high maximum weight will normally be more expensive, heavier to ride and you won't need it, so look for something lighter. As well as the maximum rider weight you may also see a maximum rider weight for agressive riding which will be lower. This is the maximum weight for a rider who may be riding the scooter down drops or jumping over earth mounds and the like. This is because the impact on the scooter will be greater when used for these kinds of activities. Most dirt scooters can be ridden not only on uneven terrain but on pavement and smooth surfaces as well. However, they may take a little more effort to ride on smoother surfaces and won't be as quick. Some dirt scooters are designed to be super strong so that they are perfect for heavier rides who want to do jumps on BMX trails and the like. If you have this in mind, make sure that the scooter will take your maximum weight when riding aggressively. 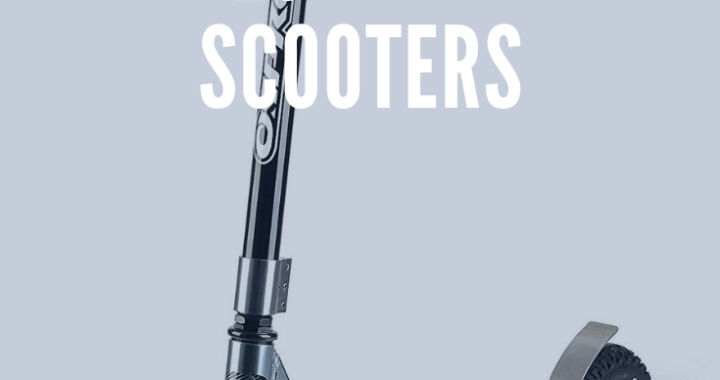 Also look for a dirt scooter with a fully welded aluminium construction which is light enough to do tricks but strong enought to take the impact. It would be possible to get a scooter that could for the school run in the week and off road fun on the weekend. If this is the case look for one that is easy to ride on smoother surfaces like pavements as well as off road. The handlebars should be at a comfortable height so it's easy to control the scooter. This tends to be around mid hip to waist height although some people do prefer them to sit lower. The handlebar will be fixed, not adustable. This is because the scooter needs to be strong, a foldable or adustable handlebar creates weak points. Wider bars are generally preferred for any stunts and tricks you may want to do. Most handlebars will feature soft grips for comfort when bumping over the ground. All handlebars should feature Hidden Internal Compression. You will see a y style handlebar or a straight handlebar. Either is fine and is a matter of preference. Not all dirt scooters features a kick stand and it shouldn't really be a deciding features but a kick stand is nice to have so you don't have to store it lying down. The decks should offer superior grip. They will vary in length and width. Like all scooters a shorter deck is better for smaller riders. Choose the deck which is more comfortable for you. Ideally it should be strong and lightweight. Most scooters will features a spring brake so you can slow down. Look for one which is easy to change if you expect to use this scooter a lot. Higher end scooters will tend to feature stronger and more durable parts and should in theory last longer. They may also feature stronger parts but be lighter which is always an advantage. The amount you pay will very much depend on how much you will use the scooter, your budget and what specifications are important to you. Depsite being such a new innovation, there are now quite a few scooter manufacturers which make dirt scooters. Perhaps one of the most well known brands is Razor who makes the RDS (Razor Dirt Scooter). But there a variety of other brands including JD Bug, Osprey and Grit that also make them. The one to buy will depend on what specifications are important to you. Check out an option below. The Osprey all terrain scooter is perfect for tackling dirt tracks and downhill runs. The large (200mm) off road tyres are perfect for scrambling around off road. The nobbly tyres offer excellent traction. The wheels feature three piece CNC aluminium metal hubs which are strong to withstand high impact manoeuvres. The chrome handlebars feature large rubber grips to keep you holding on and comfortable when riding. The hardwearing aluminium deck is designed to take the punishment of any flying rocks and gravel on dirt tracks. The stainless steel rear brake is built to offer you durable and reliable stopping power whatever the terrain. ​If you're looking for something which is solely for off road use, might like to try out a few dirt tracks or bmx trails and maybe do a few jumps and tricks - this is an excellent choice. The maximum user weight is 100kg and it's recommended for older kids through to adult. The Bikestar scooter is a good solid and study scooter choice for younger children (around 7 plus years) who want to go off road over grass, muddy paths and uneven terran. It's not a great choice for BMX trails and couldn't be used to do jumps, tricks or at the skate park because it's too heavy. But it's a good choice for an off road and on road kick scooter for kids age 7 plus. It features 12 inch (approx 300mm) wheels with pnematic tyres great for handling grass and rougher terrain. It weighs 7.2kg so is heavy so it's not a scooter you want to have to carry for long distances or do tricks or jumps with on dirt trails. The two bare feet dirt scooter is a mid range priced scooter which is a possible choice for the kid who wants to have a go at navigating a few dirt trails. If you are serious about the dirt tracks and doing tricks, go for a higher end scooter which will have metal wheel cores and other features to withstand jumps and trick. This scooter is a good choice for younger children and those who are just out beginning and want an introduction to off road scooting. Wheels The wheels have 190mm x 40mm pneumatic off road tyres. The wheels aren't a knobbly as some other dirt scooters but they do offer grip and traction on a variety of surfaces. Weight - It weighs 5.5kg so it's should be fine smaller kids to manoeuvre and control on off road terrain. Age Recomendation - it's suitable for ages 7 plus and has a weight recommendation of 100kg. You can also buy this scooter on ebay. If budget isn't a problem, the Lucky dirt scooter is top of the range, extremely well designed and durable. This is an expensive dirt scooter, so what are you getting for your money? Well it's extremely strong while still being lightweight. If the kid you are buying for is serious about doing tricks and jumps on the bmx trails and dirt tracks, this will be an excellent scooter. And as a bonus it's a stylish too. Construction - the bar is made of 4130 chromoly and TID welded so at 5.1kgs is extremely lightweight for a dirt scooter but super strong too. It features a 5” wide x 25" long deck made from aircraft grade aluminum and robotic welded. The scooter has a total height of 97.5cm and the bars measure 58cm high and have a width of 58cm.The scooter features an SCS compression system which is the strongest compression system out there. Brake - the brake uses 18 gauge spring steel. It's the perfect angle and comes with an anti-vibration pad which is brilliant if want a top of the range dirt scooter. Grips - the scooter uses Lucky Vice Grips. They have been designed to be "super grippy" but are also super comfortable and durable. Fab when flying around over the mud. Wheels - Lucky partnered with Kenda to add dirt-gripping 200mm wheels with strong aluminium cores which will have you flying down the dirt tracks. This is an excellent solid mid range budget dirt scooter perfect for kids scooting offroad. If you are serious about tricks, the Lucky dirt scooter or Osprey are probably better choices. But this is great for younger kids who want to try out some off road scooting, along grass and uneven terrain. Scooter Weight is approximately 5.8kg, not the lightest but should be fine for scooting along off road. Full scooter height - it measures 83.8cm from top to bottom. It's recommended for kids (aged 7 and above) through to adults. Ideally the handlebar should come up to between hip and waist height for better control. Another great dirt scooter for kids, the Razor Pro RDS Stunt scooter is a strong dirt scooter (on the lighter side) which has wheels and tyres perfectly designed for tackling the dirt. Wheels The scooter features 200mm pneumatic tyres with an aggressive tread pattern which are perfect dirt tracks. The wheels feature molded Nylon 6 (PA 6) hubs with 60 psi to help withstand the impact from jumps and bumps on dirt tracks. What Are the Best Scooters for Teens? The best scooter for a teenage girl or boy will very much depend on what they want to use it for. If they want to use their scooter to do jumps, stunts and tricks at a skate park, then it's important to get a stunt scooter which are designed to withstand the impact. Other teens may just want something cool to get the from a to b (perhaps to school) and then you can consider a traditional kick scooter or an electric scooter if speed is their aim. 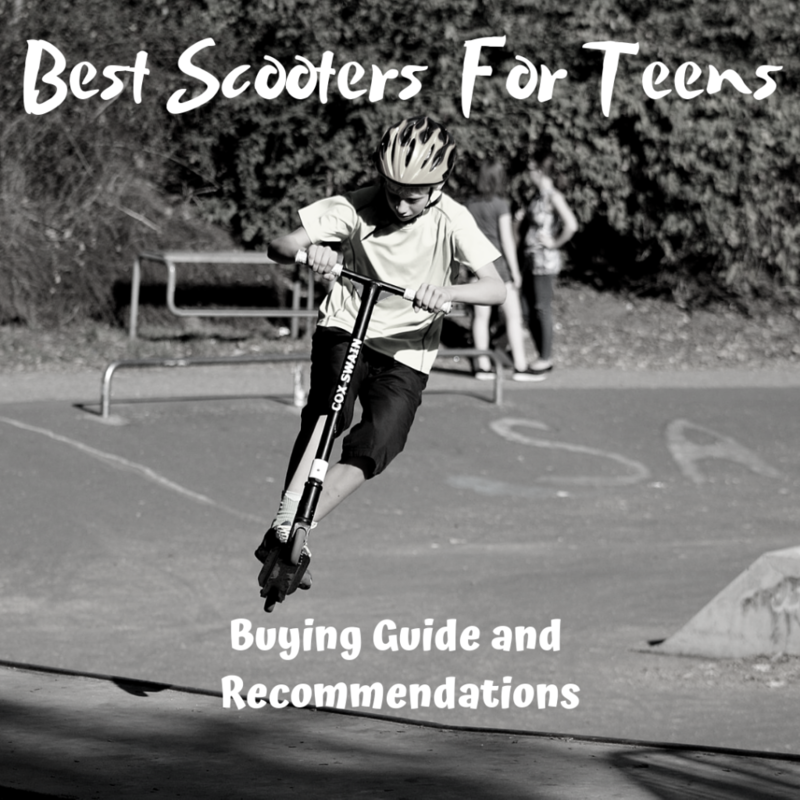 This article has tons of information to help you choose the best scooter for a teenager depending on their wants and needs. The Razor A6 scooter has everything a teen will need to get him or her from a to b quickly. The urethane 254mm big wheels take you faster, further and it's easily foldable for taking on public transport or storing under a desk. Height adjustable handlebar - the height adjustable handlebar will suit teens of all different heights. It adjusts all the way up to 106.7 cm so if your teen has a massive growth spurt this scooter will accomodate the tallest teens. Wheels - if your teen is planning to travel long distances, the 254mm wheels will get him there quickly and in no time at all. Bigger wheels mean the scooter will take you further in a shorter amount of time. Foldable - the scooter is foldable and the folding mechanism doesn't rattle. Weight - the scooter weighs 5kg. It isn't the lightest of scooters due to the weight of the extra large wheels. However, at 5kg most teens will have no trouble folding it and taking it on and off public transport or putting it into storage when they need to. Other features - there is a kickstand and rear fender brake for quick stopping. Verdict - A great scooter from a well known brand which will suit teens who want to go places on their kick scooter. Kick Scooter Vs Stunt Scooter - Kick scooters are designed to get you from a to b whereas stunt scooters are primarily designed for doing jumps and tricks at the skate park. Therefore a stunt scooter has to be stronger but still as lightweight as possible to withstand the extra impact needed. This means a stunt scooter will often be more expensive than a kick scooter. Kick scooters tend to be lighter, foldable and have height adjustable handlebars. You won't see folding mechanisms and height adjustable bars on a stunt scooters as these would be weak points when doing tricks. Stunt scooters will always have a one piece handlebar. If you're looking for a quality beginner stunt scooter for a teenager the Madd Gear MGP VX8 stunt scooter. Wheels - 110mm wheels - really when buying for a teen you want 110mm wheels rather than 110mm wheels. 110mm wheels are faster, last longer because they have more urethane, look good and mean a taller scooter. Weighs - 3.67kg - fairly lightweight. Lightweight stunt scooter are better for doing tricks as they are easier to control. Strong and durable with a threadless fork, corrupt core wheels with MGP proprietary polyurethane and full printed grip tape. If you're not sure what any of this means, check out the brief guide to important features on a stunt scooter below or read more in depth detail in our stunt scooter buying guide. Verdict - the Madd Gear MGP VX8 stunt scooter isn't cheap, but if he or she want a durable and strong scooter to take the skate park, it's difficult to go wrong. Big Wheels vs Small Wheels on Kick Scooters - The wheels sizes on scooters vary from 98mm up to around 254mm. Bigger wheels (around 200mm and higher) are popular on commuter scooters as they get you from a to b quicker. Bigger wheels will wear out less quickly as they have more urethane. However, some people prefer smaller wheels as they add less weight to a scooter so they scooter will be lighter to carry when needed. Scooters with smaller wheels also fold down more compactly. They tend to be less expensive as well. The JDBug MS 150 has mid sized 150mm wheels, which means fast and easy transport but still keeps the weight limit low enough to carry the scooter for longer distances if needed. Great for scooting round campus or to and from school and friend's houses. Wheels - the 85a PU 150mm wheels offer a fast but smooth ride. 150mm wheels won't roll as quick as a scooter with 200mm wheels but they keep the weight of the scooter low while still being speedier than standard 100mm wheels. The ABEC 9 rated bearings provide a fast and smooth roll along footpaths. Footplate - the footplate measures 51cm long by 10cm wide. Foldable - The scooter is easily foldable so perfect for storing at school / home, putting in the boot of the car and taking on public transport. Folded dimensions - it folds down to a compact 69cm (L), 10cm(W), 20cm (H). This can be useful if it need to be kept in a locker or small space under a desk. Weight - the scooter weighs 3.3kg which makes it easy to carry onto a bus or train if needed. It comes in lots of different colours. Verdict - this is a great option of a kick scooter for teens particularly if it's used for short commutes to and from school and the like. It will offer a speedy ride while still being light enough to carry when needed and it will fold down compactly if it needs to be stored in a small space. Wheels on Stunt Scooters - You will see 100mm, 110mm and 125mm wheels on stunt scooters for teenagers. The bigger the wheel, generally the more expensive the scooter. 110mm wheels tend to be the best choice for the beginner and intermediate teen. They go slightly faster than 100mm wheel, last a bit longer (more urethane) and look better. But a cheaper scooter with 100mm wheels may be fine for a younger teen and 125mm wheels a top choice for an advanced rider. Always go for wheels with a metal rather than a plastic core. Metal cores can withstand the impact from jumps and tricks whereas plastic cores won't last as long. This is an awesome option for teens who are serious about scooting at the skate park. It's light, durable and strong and features fast 120mm wheels. Wheels - the 120mm wheels with ABEC 9 bearings are great for intermediate riders who want some extra speed for their tricks. The bigger wheels also means it's faster when getting from a to b along the streets as well. So it mixes well between the skate park and on the streets. Handlebars - the bars measure 62cm (24.4 inches) in height and 54cm (21.25 inches) in width. The complete scooter height is 84cm (33 inches). Ideally handlebars should come up to around hip to just below waist height on stunt scooters, although riders have different preferences. Deck - the deck is 49.5cm (19 inches) by 12cm (4.7 inches). The scooter also features IHC compression and an integrated headset. Weight of scooter - scooter weighs 3.8kg. Verdict - this is a excellent, high quality, stunt scooter which teens will love to stand out at the skate park. Also great for cruising along the streets. Handlebar height and width (stunt scooters) - the handlebar on a stunt scooter generally comes up to around hip to waist height. However, some teens may have a preference to whether they like taller or shorter bars. But generally you don't want bars that come up over your waist or really low to your thighs. The width of the bars should be about the same as the width of your shoulders. The Grit Elite Pro Stunt scooter is designed for intermediate and advanced riders so if your teen has been at the skate parks for a while this is a good choice. It is on the more expensive side but with scooters like everything else generally scooters at the higher end meansbetter components. And this scooter doesn't disappoint. It's strong and durable but also lightweight at 3.44kg which makes it easier to manoeuvre for tricks. The wheels are alloy cast core 110mm 88A PU wheels with ABEC 9 bearings fitted as standard. Metal core wheels such as these ones are a must for stunt scooters. Otherwise you'll be bringing in your scooter for metal core wheels to be added. What level of use? Whether you buying for a beginner, intermediate or pro will affect how much you spend. A beginner will want something they can just get started on, you can upgrade parts such as wheels if they pursue the hobby. Handlebar - The one piece handlebars are 51cm (20") wide and 87cm (34") high bars. They are 'Y' style bars for extra stiffness and strength. Many teens will prefer this style of bars too. Wheels - the wheels are 110mm, perfect size for beginners and intermediate riders. They have alloy cores which will withstand the impact of landings from jumps and feature durable PU 88a tyres. Weight - at 5kg it is on the heavy side for a scooter. 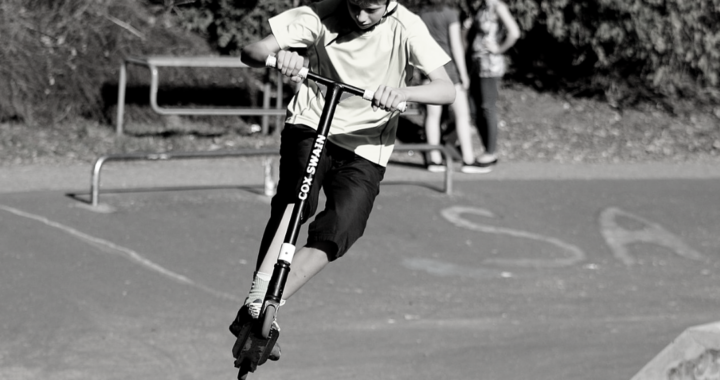 Lighter scooters are easier to control when doing tricks and stunts, so if your teen is serious about using it at the skate park it may be worth looking for a lighter model. Other features include sealed bearing headset and 1080 pro flex brake. Verdict - this scooter looks awesome. It's 110mm alloy core wheels are good for crusing and doing tricks. However it is on the heavy side which might be a black mark for some. What about an electric scooter for a teen? Electric scooters are fun and will enable teens to get use them without breaking out a sweat which is good if you need to be somewhere and looking good! The downside is that at the time of writing it's not currently legal to ride them in the pavement in the UK. However, due to the fact that electric scooters are an eco friendly way of travel an overhaul of travel laws may mean that it may soon be legal to allowed on British roads. The E300 razor electric / motorized scooter is the speediest scooter that razor make, meaning it's a good choice for teenagers. The top speed is 15 mph. It has 40 minutes of continuous use on one battery charge. The wide front and rear pneumatic tyres also make it a speedy, comfortable and smooth ride. The scooter features twist grip acceleration control, a hand operated rear brake and a retractable kickstand. The maximum rider weight is 100kg. Pneumatic Tyres - some scooters have pneumatic (air filled) tyres. The advantage of these is that they will offer a very comfortable ride over bumps and cracks in the pavement or path. They are particularly good if you have to go over rougher surfaces such as cobbles on your journeys. They also offer more grip when it's wet. The disadvantage of airfilled tyres is that they will require some maintenance to ensure they are pumped up to the correct pressure (like you would have to do on a bicycle) and you might have to deal with punctures. They also tend to add some weight to the scooter so will be heavier to carry when needed. Razor are a well known brand of scooter and this is their A5 commuter scooter which has air filled / pneumatic tyres as opposed to the urethane / PU wheels that you find on many scooters. The tyres gives a smooth ride over bumps and cracks in the pavement much like a bicycle would. The scooter itself has been designed for students on campus or urbane coummutes and is recommended for kids from aged 8 all the way up to adult. So it would be perfect for the teenage crowd. Wheels- the 200mm pneumatic wheels are tough enough to withstand the roughest urban terrain (great of cracks, bumps, cobbles etc). Handlebars - the handlebars are anti rattle to add to the comfortable scooter ride. The handlebars are also height adjustable. The handlebars feature soft rubber grips for enhanced comfort, grasp and control. Foldable - thes cooter features a super strong easy fold t-tube. Deck - the deck measures 35cm (13.4 inches) and it supports riders up to 100kg. Verdict - this is a great scooter for teens whether it's for the school run, using around college, running errands and getting to friend's houses. The pneumatic tyres are shock absorbing so offer a comfortable and smooth ride even of rougher urban surfaces. Handlebar on a Kick scooter - When looking for a kick scooter for a teenager, consider that the handlebars should really come up to waist height for a comfortable ride. A foldable handlebar is fab for easy storage and for carrying and taking onto public transport. The Hudora Big wheel scooter is a great sturdy kick scooter which is suitable for older children, teens and adults. It's big wheels mean that it can pick up some speed when travelling to friend's houses or school. It also has an adustable handlebar height from 79 to 104 cm so will be fine for growing teens. Wheels - the 87a 205mm PU wheels are durable offer speed and comfort when scooting along paths and pavements. The bigger the wheel the faster you can go and big wheels also offer a smooth ride even if you go over bumps in the pavement so the wheels are a good size for gettting places. Adjustable handlebar - the handlebar adjusts from 79cm to 104cm so it can suit kids from about age 8, through the teenage yeas and even adults. Maximum rider weight- The maximum weight for a rider is 100kg. Foldable - features a pratical folding mechanism. Other notable features - has a carry strap so it can be easily carried onto public transport or wherever you need. It also has a kick stand for upright storage. Off road or dirt scooters - are great fun, teens will love them. They are great for going on dirt tracks, bmx trails, on the grass and other off road terrain. Dirt scooters tend to have bigger wheels with pnuematic tyres as they offer a smoother ride on rougher terrain.There is no reason why you couldn't ride an off road scooter on the pavement and use it on other terrains at other times.Check out the dirt scooter guide for more information on what to look for in a dirt scooter. Like stunt scooters, dirt scooter have to be strong and durable. The Osprey scooter features tough pnuematic rubber all terrain tyres and supported on aluminium core wheels so they can withstand the impact on different terrains. The strong aluminum deck is designed to withstand the punishment of stones and the like hitting it. And the stainless steel rear brake offers durable and reliable stopping power in road conditions. How Much To Spend? - scooters vary wildly in price so it can be difficult to know how much exactly to spend and what you are getting for your money. The level of use may dictact how much you spend on a scooter for a teen. If they are likely to be using it everyday it makes sense to spend as much as you can afford to make sure that the scooter is durable and lasts. Brand name scooters like Razor and Micro often make good choices as they are built to last and Micro scooters in particular can be easily repaired and have parts replaced. If they are only using a scooter occasionally it makes sense to go with a less expensive scooter. Wheels - the PU wheels are 200mm. The bigger the wheel the quicker the ride so these wheels big enough to get teens where they want to get to quickly. Built in Suspension - the iscoot also includes built in front and rear suspension. Suspension offers a more comfortable ride and is normally only seen on higher end scooters. Foldable - the scooter has a one button folding system. Maximum rider weight - the scooter can accommodate riders up to 12okg (18.9 stone). Other cool features - this scooter has lots of useful extras which includes a carry strap for easy carrying, a mud / rain guard to stop splash from the wheel hitting your trousers as you scoot and it comes in different colours too. If you're looking for a top of the range commuter scooter for your teen, it's difficult to beat the comfort and quality of the ride of the Micro suspension scooter featured. Micro scooters are well known for their superior engineering, quality and design. Their scooters are built to last and could last your teenager for years to come. Build to last - as with all micro scooters each key part of the scooter is replacable or repariable keeping the scooter out of the landfill and in working order for a lifetime. Maximum rider weight - the scooter can accommodate riders up to 10okg. Handlebar height - the handlebar are adjustable from 72cm to 103cm. The handle grips are durable and provide unbeatable control and incredible comfort. Deck - the deck is designed to be ultra flexible (being made of flexible fibrewood and glass) so it helps absorb the shocks and vibrations from the road adding to smooth and comfortable ride. The footplate measures 41cm by 127cm. Another type of scooter with a high fun factor which will appeal to many teens is a self balancing scooter. Also known as a hoverboard (although they don't actually hover in any way!). Everthing is controlled with your feet, legs and torso rather than handlebars. The one featured goes up to 10 to 15 km/h. It also comes with built in bluetooth speakers and it also has a carry bag. The carry bag is useful if you need to carry it when going uphill. ​These types of scooters don't do well climbing up steep hills, so the weight can influence which one you get. The scooter featured weighs 10 kg. It provides up to 6 hours ride time is provided with a 2 hour charge. ​Check out the self balancing scooter guide for more information on what to look for when purchasing the best model. There are a few other points worth considering when buying a scooter for a teen. 1.) Coolness factor - let's be honest, most teenagers want to look and feel cool. A scooter that isn't cool is likely to stay in storage at home. There may be brands of scooters that they would prefer. If in doubt, just ask them. Or if it's a surprise, ask their friends. 2. )Safety - consider helmets, knee and elbow pads. 3.) Ramps - they may appreciate a small ramp to practice tricks and jumps at home. A perfect compliment to a stunt scooter.